I had a chat yesterday with a colleague of mine in Portland. He had just glanced at some of the pages on this site, and referenced a slide from a presentation by Ernst Berndt, and reported in Paul Levy’s blog on 2/20/2013. You can see that the overall concentration of spend reported here is similar to my text in the “stratify patients” section. 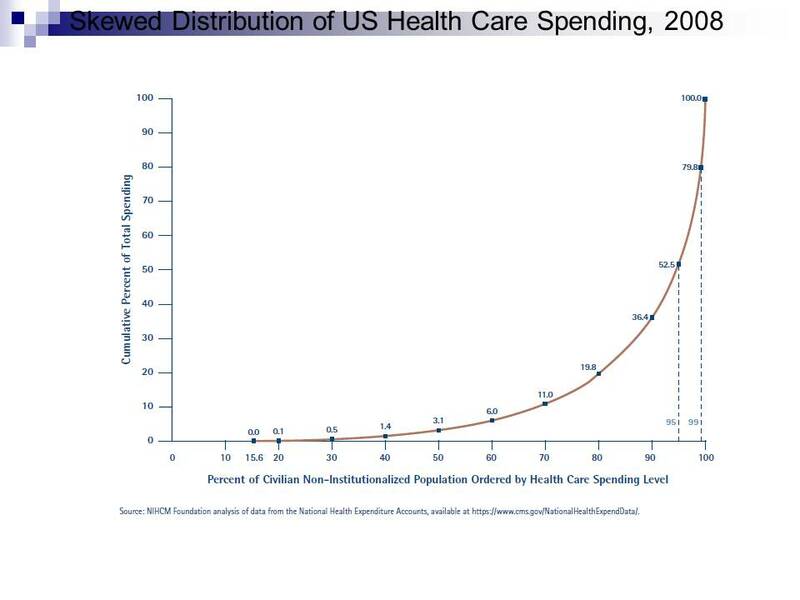 You can see that the graph shows the top 1% consume about 20.2% of care costs, and the top 5% consume about 47.5%. I think (but I am not sure) this is the overall US healthcare population (it sounds close). Thanks for Ernst Berndt and Paul Levy for broadcasting. Which populations are appropriate for care/case management focus? How ought we modify the ACA to improve it?